Some months ago, I asked the City Council for a handrail at the steepest part of Seafield Road, just south of Perth Road. This was following requests from residents, mainly elderly people. The Muirlands Sheltered Housing is close by. 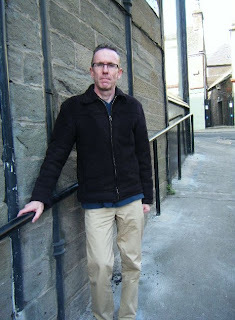 Here’s me (above) pictured in Seafield Road in the past couple of days. As you can see, the handrail has now been provided and I am pleased at the City Council’s positive response. 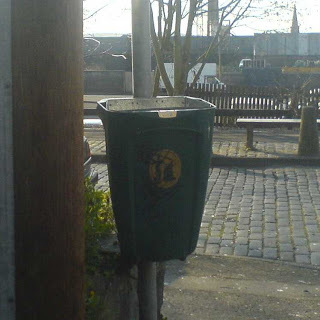 In my blog of 17th March, I reported that I had asked the Waste Management Department for a new litter bin in Blackness Street following the bin being burnt (see story by clicking headline above). Pleased to report that a new bin has now been provided (see right). Grateful to all residents who have wished me the best for May 3rd’s City Council elections – really heartened by the really positive feedback locally. Had a useful meeting with the Lord Provost and representatives of the Western Cemetery Association at the City Chambers yesterday – we are getting to the stage of the Association being formally set up with a Constitution, Office Bearers, etc, which will then allow it to seek funding for improvement works at the Cemetery. The Cemetery has an absolutely fascinating past. Have been in touch with the City Council again about the graffiti mess at Victoria Park and with Servite Housing about damage to the entrance sign at Muirlands sheltered housing. A few days since I have been able to pause for breath and update the blog – so here goes! Firstly, many of you will have read in the local press on Saturday and heard me on local radio yesterday about the deep concern of a number of tenants regarding a local landlord who has served eviction notices on them, despite their being long-standing and good tenants. I am of the view that the tenants have been treated very badly and the comments by the landlord in Saturday’s Courier accusing me of “electioneering” for having the cheek to speak out on behalf of constituents, were highly inappropriate. I am pleased to advise that I have spoken with the landlord’s solicitor today who has apologised on his client’s behalf for the comments in the press. He has proposed a meeting with myself and tenant representatives and I will be speaking with the tenants about this and hope that we will soon have a proper solution to this that allows the tenants to remain in their homes. Residents are naturally delighted the lighting is back on. 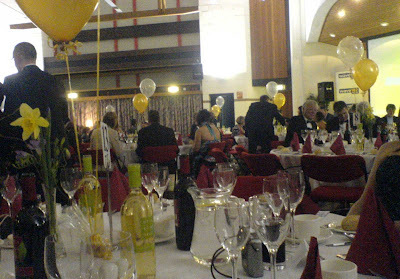 Janet & I were delighted to attend Wave 102’s Local Hero Awards last Friday night (see photo!) I had the real pleasure of presenting the “Contribution to Charity” award to Pat Stevenson, who has done so much for Advocating Together (Dundee) – a superb local organisation helping people with learning disabilities – and based in my ward in Ryehill Lane. It was a thoroughly enjoyable night – and a great credit to Wave 102 – let’s hope the Local Hero Awards will be an annual feature in the Dundee calendar.